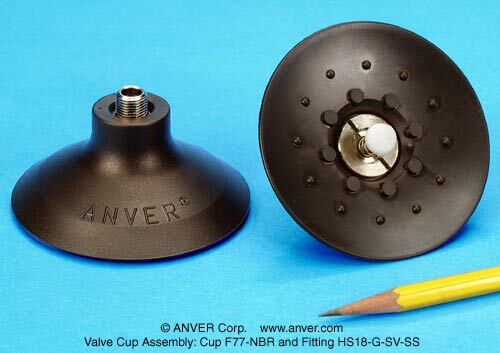 The standard materials are Nitrile and Silicone (as noted below each part number). For SLSA-1 Suspensions, use the HSHN5 Double Male 5 mm Adapter. 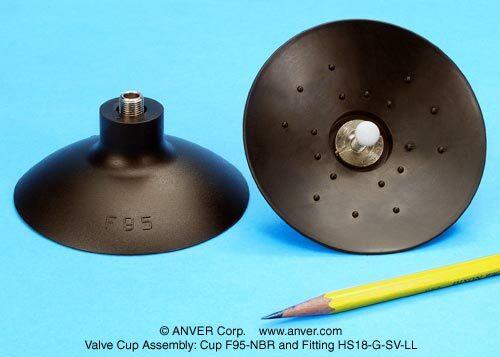 For SLSA-2 Suspensions, use the HS18G-18FG Double Female G 1/8″ Adapter. 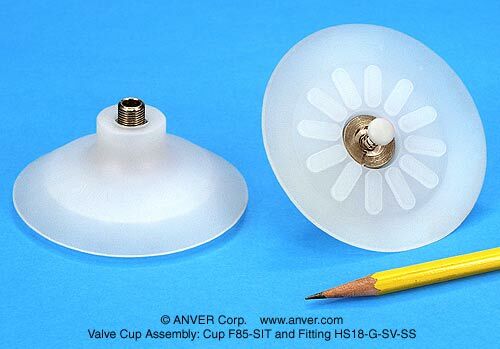 The 30 Button Valve is used in multiple cup applications. If a single cup does not contact the load, that cup’s valve will not open, causing no loss of vacuum while the other cups pick up the load. The 40 Connection Plate uses a 40 Locking Spacer. 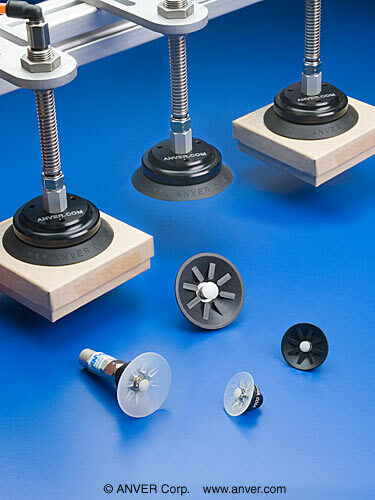 It allows you to screw directly into any of the SLSA-2 Suspensions that have a male G 1/8″ Thread. 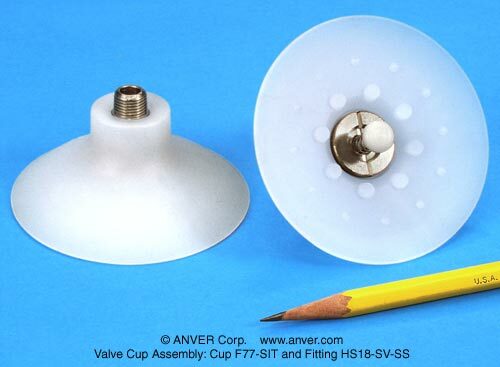 The 40 Button Valve is used in multiple cup applications. If a single cup does not contact the load, that cup’s valve will not open, causing no loss of vacuum while the other cups pick up the load. 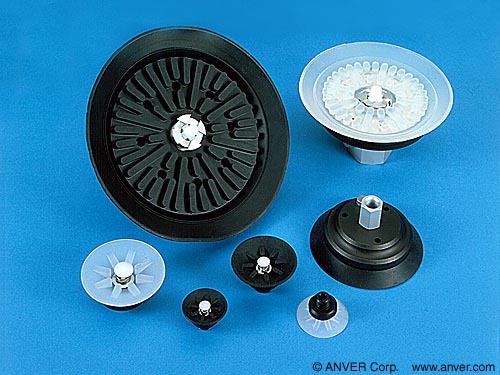 The 50 Connection Plate uses a 50 Locking Spacer. 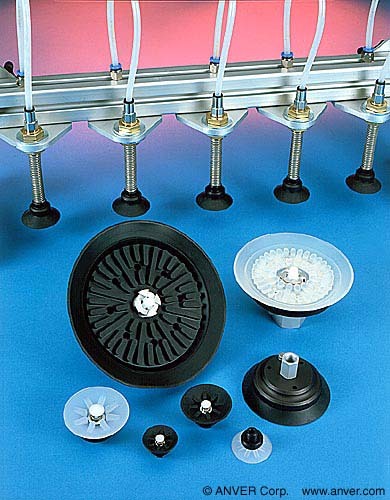 It allows you to screw directly into any of the SLSA-2 Suspensions that have a male G 1/8″ Thread. 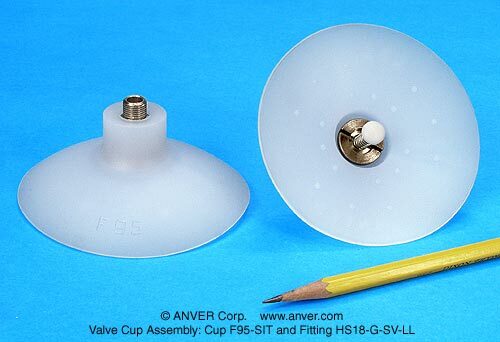 The 50 Button Valve is used in multiple cup applications. If a single cup does not contact the load, that cup’s valve will not open, causing no loss of vacuum while the other cups pick up the load. 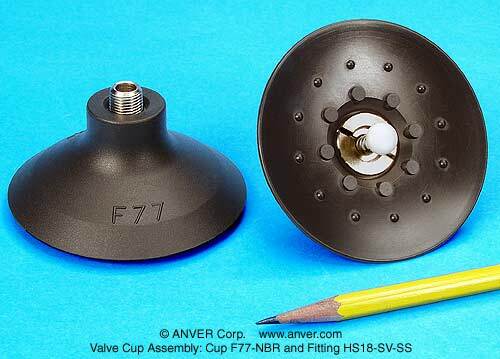 The 75 Fitting 1/8″ with 1/8″ female center port connection with optional M5 (10/32) female port often used as a blow-off port. 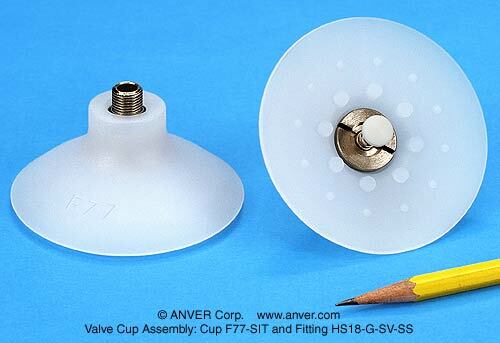 The 75 Button Valve is used in multiple cup applications. If a single cup does not contact the load, that cup’s valve will not open, causing no loss of vacuum while the other cups pick up the load. 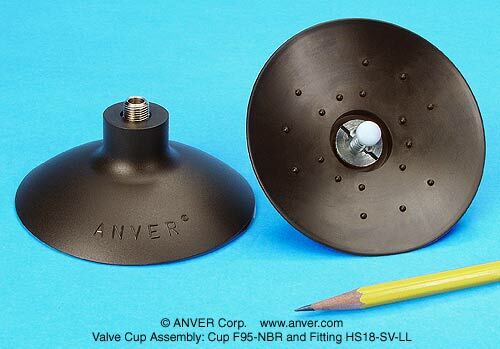 The 110 Fitting 1/2″ with 1/2″ female center port connection with optional NPSF 1/8″ female port often used as a blow-off port. 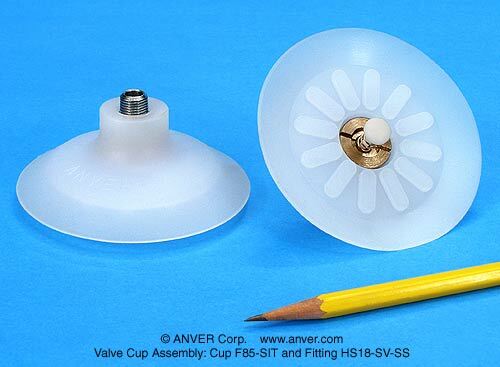 The 110/150 Button Valve is used in multiple cup applications. If a single cup does not contact the load, that cup’s valve will not open, causing no loss of vacuum while the other cups pick up the load. 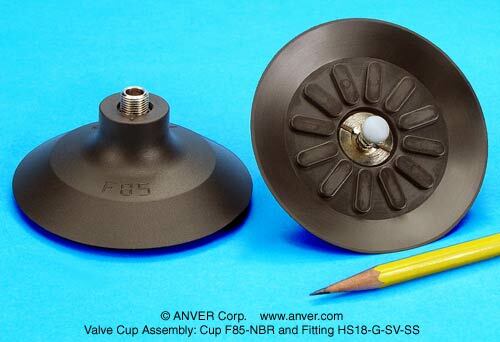 The 150 Fitting 1/2″ with 1/2″ female center port connection with optional NPSF 1/8″ female port often used as a blow-off port. 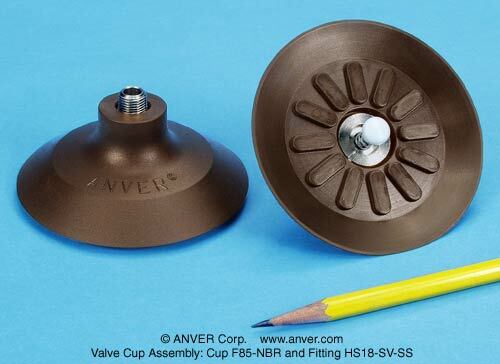 Many new Valve Cup Assembly options are now available by combining select ANVER cups and ANVER fittings to form ‘ANVER Valve Cup Assemblies.’ Using the chart below, click on any photo to see an enlarged image of the completed ANVER Valve Cup Assembly. Click on a cup photo under ‘Made from This Cup…’ to get technical and ordering information for the appropriate cup; click on a fitting photo under ‘…and this Fitting‘ to get technical and ordering information for the appropriate fitting. If you click on the small thumbnail photo it will enlarge for more detail and specifications. All cups shown above are identical to P-Style size and shape. The static column is the cup dimensions without a load as given by P-Style. The compressed column specifications are the important ones to make sure everything fits. It is the actual size of the cup after full compression (being flattened out) on a level load, which is slightly different from the F series. The bigger the cup, the greater the enlarging of the diameter. A lower vacuum level will lessen this compression or flattening out; however, make sure to leave enough room for the cup under vacuum in your design.